Living in a large city can be lonely at times, but having a good support system can be essential in living a healthier, happier life. With this in mind, we wondered which cities throughout America had the strongest sense of community? To calculate this, we looked at the top 50 metropolitan areas throughout the United States and used numerous factors, including the amount of community events in each city, the amount of community centres, walkability, the number of parks, community happiness score, and crime rates, and weighted each factor to calculate an overall “sense of community” score ranging from 0-100 and we found some interesting results. California contains four of the top ten cities with the strongest sense of community, with Los Angeles being the top city because of its high marks for its community centers and parks, walkability, and crime rate. San Francisco, San Diego, and San Jose rank 2nd, 4th, and 6th respectively. It’s fitting that Memphis is the home of the blues as, sadly, this city has the lowest sense of community score due to its low scores across the board for community events, community centers, walkability, community happiness, and crime rate. 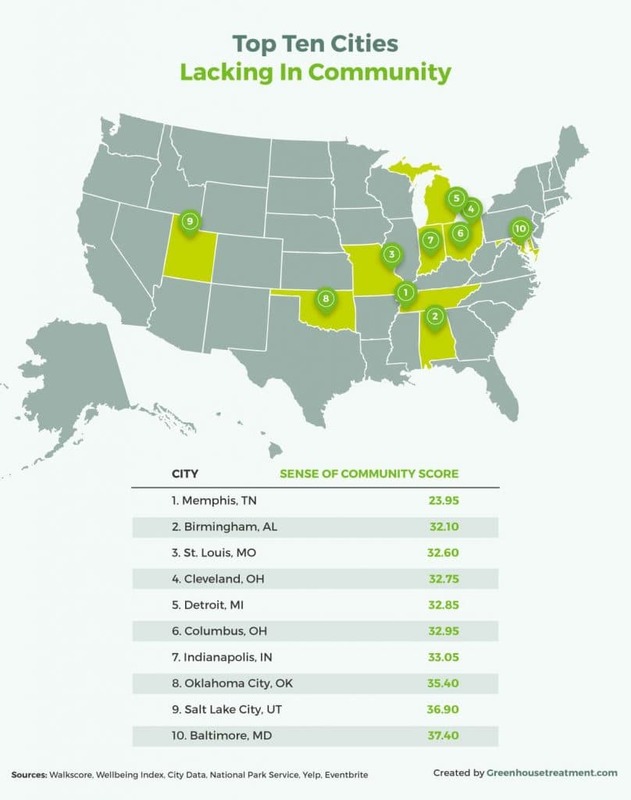 Interestingly, four of the top ten cities lacking in community are clustered closely together, with Cleveland, Detroit, Columbus, and Indianapolis all featuring low scores across the board. Overall, New York and Pittsburgh scored the highest for the number of community events they offer and Los Angeles scores the highest for the number of community centers. New York and San Francisco scored the highest for walkability, and a wide range of cities, including Houston, Jacksonville, Kansas City, Nashville, New Orleans, Phoenix, San Diego, and Virginia Beach, scored the highest for parks. 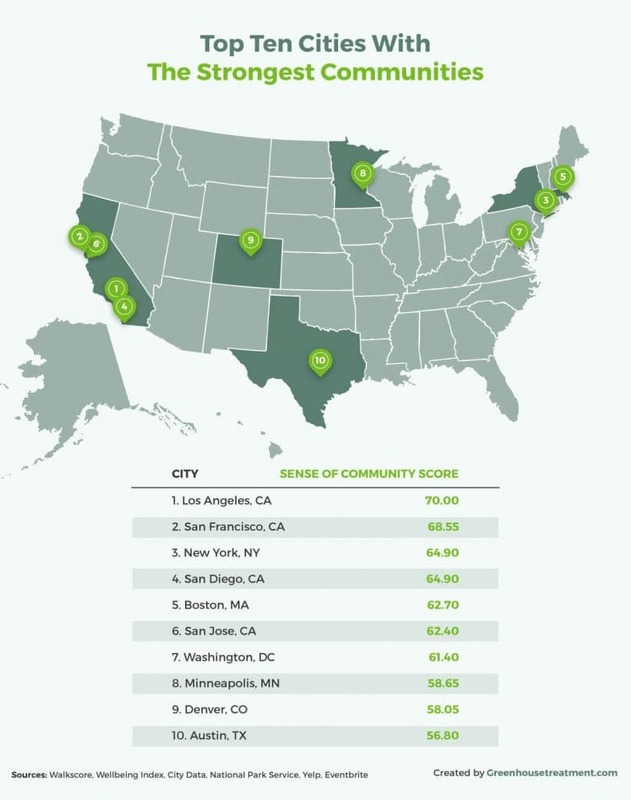 Community happiness was another contributing factor to sense of community, and Austin, Minneapolis, Nashville, Raleigh, San Diego, and San Antonio were the top scoring cities in this category. 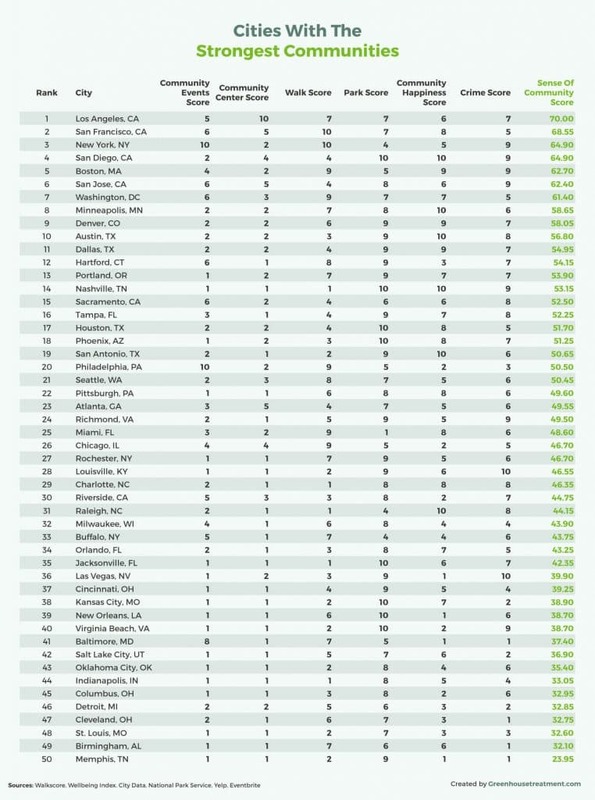 Finally, looking at the cities with the lowest crime, Las Vegas and Louisville score the best for having low crime in their communities. They say it’s pretty hard to be bored in New York and this certainly rings true because we found that, overall, New York is the best city for community events, with Philadelphia, Baltimore, San Francisco, and Washington, D.C. following closely behind. When it comes to cities with the most community centers, California dominates the top 5 list with Los Angeles in first place, San Francisco in second place, San Jose in third place, and San Diego in fifth place. San Diego is the best city for parks overall with Nashville, Houston, Phoenix and Jacksonville also offering a wide range of parks to feature in the top 5 cities for parks list. 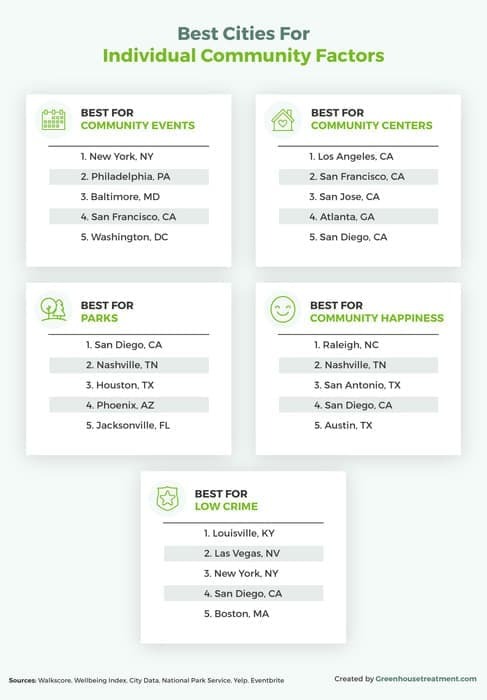 Southern hospitality and charm must be doing something right as the best city throughout the country for community happiness overall is Raleigh. Nashville, San Antonio, and Austin are also featured in the top 5 with their southern charm. Looking at crime levels, the city with the lowest crime rate throughout the country is Louisville. Las Vegas, New York, San Diego, and Boston follow closely behind with low crime levels in contrast to their population. So there you have it! Los Angeles is the city with the strongest sense of community in the country overall. A strong community is vital in supporting individuals faced with drug addictions onto the road to recovery. If you know anyone in your life suffering from drug addiction find out more about how you can help. The information and graphics in this blog post can be used and displayed by all commercial and non-commercial websites without charge. However, use is only permitted with proper attribution to GreenhouseTreatment.com. When using this information or any of these graphics, please include a backlink to this page.